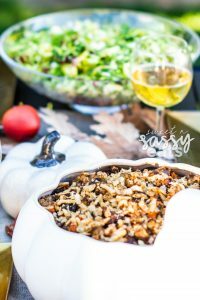 I don’t know about you, but I LOVE stuffing! Hopefully, by now you’ve learned that cooking your turkey stuffed with this stuff is a big NO, NO! You run the risk of contamination from the raw turkey in your stuffing, so now if I cook a turkey whole instead of a Spatchcocked Turkey , then I fill the cavity with aromatics (like cinnamon, apples, onions & herbs) to help flavor the bird. 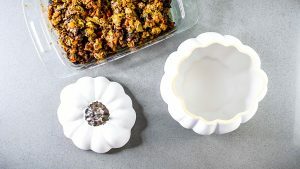 Even though we don’t stuff our bird, we’d still like to have stuffing as a side, it’s just not Thanksgiving without it! 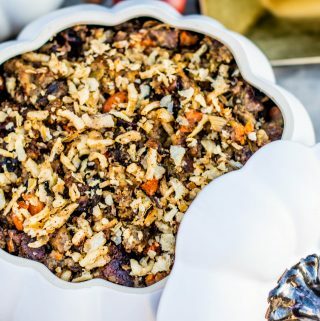 So, enter the yummiest stuffing ever! I cooked it in the Instant Pot, but you can totally follow these instructions and cook on the stove top if you’d like! Feel free to add or subtract any of the veggies or proteins, or even add your own ideas if you’d like! We love Chicken Apple Sausages at our house and love the added flavor and texture they add to this dish! Heat Olive oil in large skillet or heavy-bottomed pan over med-high heat. Add chopped onions, carrots & celery and a little bit of salt. Cook for 2-3 min. Add sliced mushrooms, garlic & fresh herbs, cook 2-3 mins. Push veggies to the sides, creating space to add Sage Sausage and brown. Turn heat off, add stuffing cubes & stir. Cover for a few minutes. Preheat oven to 325. 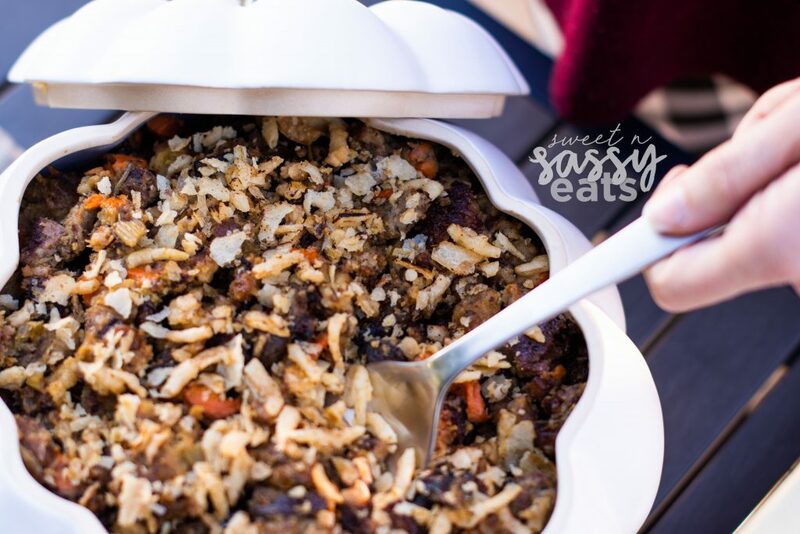 Loosely pack Stuffing in a buttered Casserole dish and top with Fried onions. Bake until crispy 20-40 minutes. 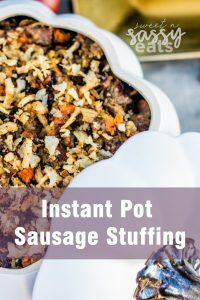 This stuffing has such a depth of flavor that is only this intense because it is cooked in the instant pot. 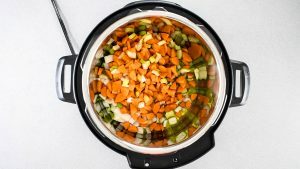 The pressure cooking enhances all the flavors like it was cooked for hours! Doesn't take up a pot on the stove either! 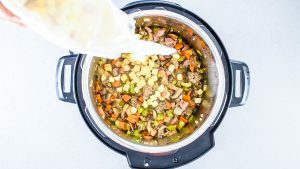 Turn instant pot onto to Saute mode. Add Olive Oil and saute onions, celery & carrots. Cook for 3 minutes. Add fresh herbs and cook another 2 minutes. Make space for sage sausage, brown sausage. Add mushrooms and diced chicken sausage links. Add Salt & Pepper, stir to combine. Add chicken broth and stir. Make sure to scrap the bottom of the pot to deglaze the pot. Turn off Saute mode, allow the pot to cool slightly. 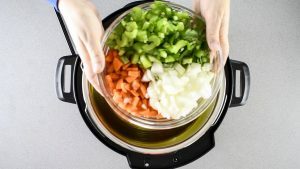 Then cover and seal your instant pot. Set to high pressure and 12 minutes. 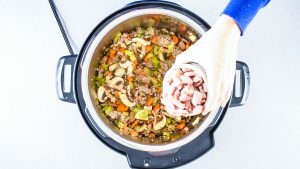 Let instant pot release naturally, remove lid and fluff. If you like a more wet stuffing, stop here and dish into a serving dish, top with fried crispy onions. If you want to dry your stuffing out, place in casserole dish, top with crispy onions and bake at 350 degrees for 10 min, serve. *When scrapping the bottom of the pot, make sure to get all browned bits off of the bottom, otherwise, you'll get a burn warning during pressure cooking stage. Also, allow the pot to cool down before moving to the pressure cooking stage.